This intro Unity tutorial will get you up and running with Unity 2D by creating a lunar landing game. Update 3/15/17: Updated for Unity 5.5. Unity is an extremely popular and versatile game engine that has a long list of supported platforms and devices to its credit. Although 3D gaming seems to be the latest craze, a large portion of mobile, console and desktop games are presented in 2D, so it’s important to understand the features Unity provides for building 2D games. How to work with sprites and the camera. How to use Physics 2D components to handle collisions and gameplay. How to set up 2D animation and states. How to apply layer and sprite ordering. If you don’t already have Unity 5, download it from Unity’s website. Note: If you are new to Unity, you can read our Intro to Unity tutorial to get you up to speed. Download the starter project for this tutorial, extract it, and open the LowGravityLander-Start project in Unity. The starter project is a functional 2D space lander game, but it has a few problems you’ll need to solve before you can truly call it finished. Ready for lift off (and a perilous journey down to the closest landing pad)? Time to get started! This option has already been set in the starter project for you. Sprites are easy to work with in Unity thanks to a great 2D workflow and built-in editor. That’s all it takes! The Sprite Renderer lets you display images as Sprites in both 2D and 3D scenes. Delete the playership GameObject from the Hierarchy. Multiple: A sprite with multiple elements, such as animations or spritesheets with different parts for a character. The reason for using spritesheets is that every image you use in your game will take up one draw call. For a few dozen sprites, this isn’t a big deal but as your game grows in complexity and scope, this could be a potential issue. By using spritesheets, you are making just one draw call for lots of Sprites, thus giving your game a performance boost. 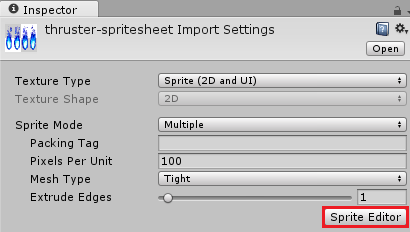 Of course, organization of your spritesheets is just as important as using them, but that’s for another tutorial. It’s convenient to pack multiple graphic elements into a single image for animations or objects that have lots of moving parts; Unity makes it easy to manage these spritesheets with a built-in 2D spritesheet editor. You’ll use two spritesheets in this game: one for the lander’s thruster animation and one for an explosion animation. Both of these animations consist of multiple frames, which you can edit and slice using the Sprite Editor. explosion-spritesheet.png has already been sliced and prepared into an animation for you, but the thruster-spritesheet.png still needs some attention. That’s your next task. 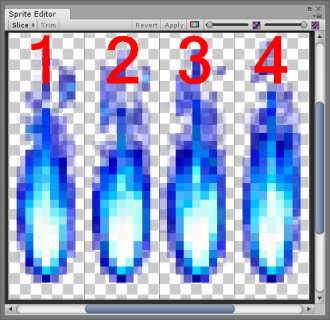 Click thruster-spritesheet.png in the Sprites folder of the Project window. 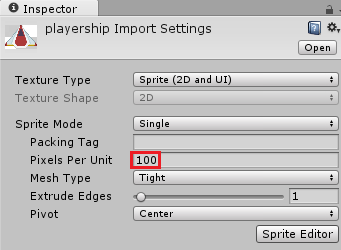 In the Inspector the Sprite Mode is already set to Multiple (if not, change it then click Apply). 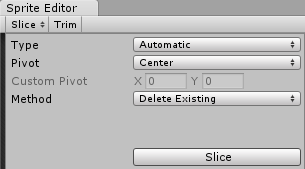 Automatic means Unity will attempt to locate and slice your spritesheet on its own to the best of its ability. In this case, Automatic would work just fine, but you could also slice your spritesheet by cell size or by cell count. 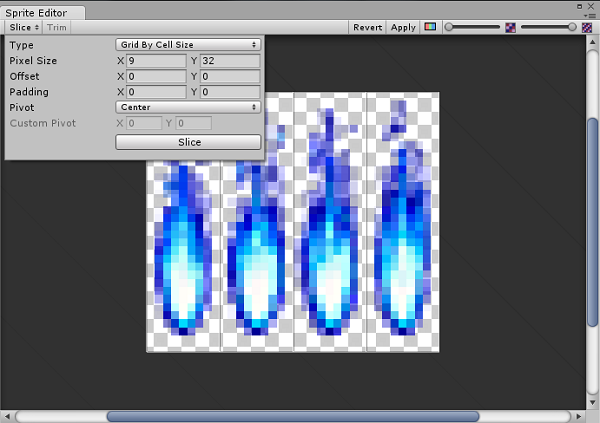 Selecting the cell size option lets you specify the size of each frame in your spritesheet using pixel dimensions. You’re done – you can close the close the Sprite Editor now. 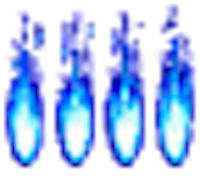 Your thruster spritesheet is now ready for use. Right now, you can’t actually see the lander in your game. That’s because it doesn’t have any Sprite Renderer components attached. There won’t be any spectacular landings – or crashes! – if the lander isn’t visble on the screen. To fix that, click the Lander GameObject in the Hierarchy. In the Inspector, click Add Component, then type Sprite Renderer in the search text field. Finally, choose the Sprite Renderer component. Set the Order in Layer to 1. Your next job is to assign the landing gear sprite. 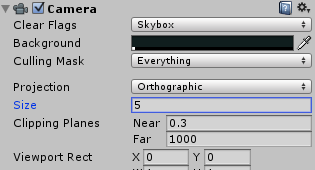 Unity 2D projects have an orthographic camera view by default. Generally you’ll want to stick with this in your 2D games instead of using the perspective camera view. You can learn more about the differences between Perspective and Orthographic over here. As noted above, the Projection property is set to Orthographic. So…what does “100” mean in this case? Units in Unity don’t necessarily correspond to actual pixels on the screen. Instead, you’d commonly size your objects relative to each other on some arbitrary scale such as 1 unit = 1 meter. For sprites, Unity uses Pixels Per Unit to determine their unscaled size in units. Think about a game that uses a static camera and displays the the backdrop sprite fullscreen, similar to the wallpaper on your computer desktop. 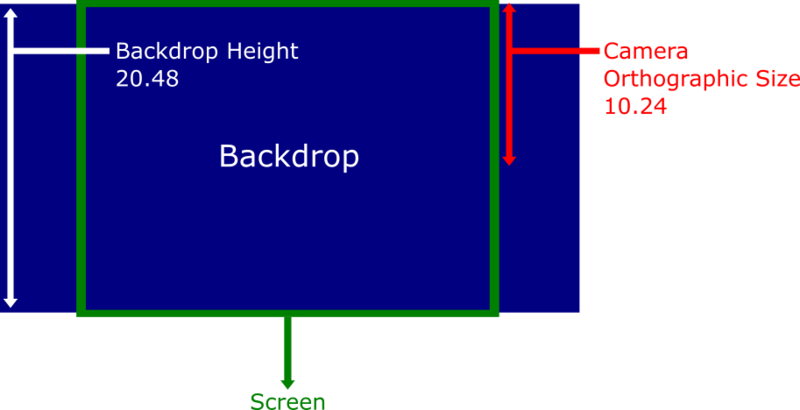 backdrop.png is 2048 pixels tall, and has a default Pixel Per Unit ratio of 100. If you do the math, you’ll find the the backdrop GameObject in the Hierarchy will be 20.48 units tall. You don’t need to change the camera in your project, however, as the current size of 5 works fine for the moving camera in your game. The Max Size property of the sprite’s Import Settings lets you define a maximum size for your sprite, measured in pixels. You can override this setting for each platform you’re planning to target. Zoom in to your scene view backdrop on the light blue galaxy. Note that it’s slightly blurry; when you import a sprite, the Max Size property defaults to 2048. Unity had to scale down your image to fit the default texture size, with a resulting loss of image quality. Setting Max Size to 4096 lets Unity to use the full 4096 x 4096 texture instead so you can see the detail present in the original image. Increasing the size of the texture increased its memory footprint by a factor of 4. It is also worth mentioning that there are override settings for the other platforms that Unity supports building against. You can use these override settings if you plan to build your games for other platforms, and wish to set different size and format settings for different platforms. Note: 4096 x 4096 is a fairly large image file; try to avoid using this size when possible, especially for mobile games. This project uses a large image only as an example. You might want to adjust the Format of some textures to improve their quality, or reduce their size, but this either increases the memory footprint of the image, or lowers the texture fidelity depending on which way you go. The best way to tweak these settings is to research how each one works, testing them out and comparing quality and size of the resulting texture. The Use Crunch Compression setting of 50% takes a long time to compress, but it gives you the smallest possible file size, and you can tune this even further. Set the backdrop Import Settings back to what they were before playing with the Format and Crunch Compression settings, then click Apply. When developing your own games, you’ll need to play with the Compression settings to find the combination that results in the smallest texture size that still gives you the quality you’re looking for. 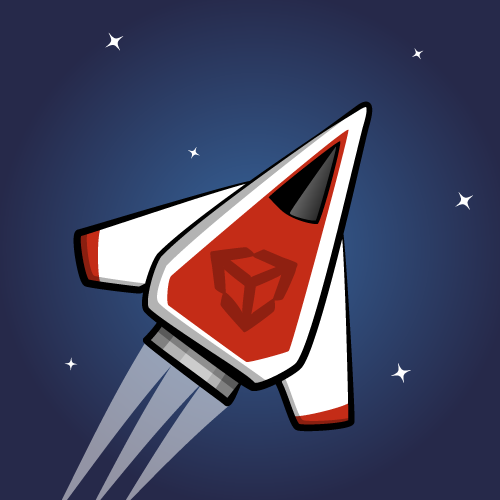 Unity lets you adjust the gravity for the Physics 2D system just as you can in 3D games. Unity’s default gravity settings for a new project are the same as Earth’s gravity, by definition, 9.80665 m/s2. 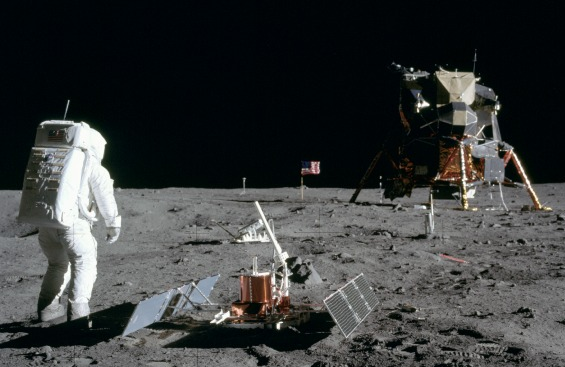 But you’re landing your spaceship on the moon, not Earth, and the gravity on the moon is roughly 16.6% of Earth’s, or 1.62519 m/s2. Note: The gravity in your starter project was set to -1 to make it easy to fly around and test the game right away. One small step up of gravity, one giant leap required for thruster power! If you’ve already tried to navigate the Lander around the scene, you’ve likely collided with a rock or two. This is Unity’s 2D collision system at work. Every object that should interact with gravity and other physics objects requires a Collider 2D component and a Rigidbody 2D component. 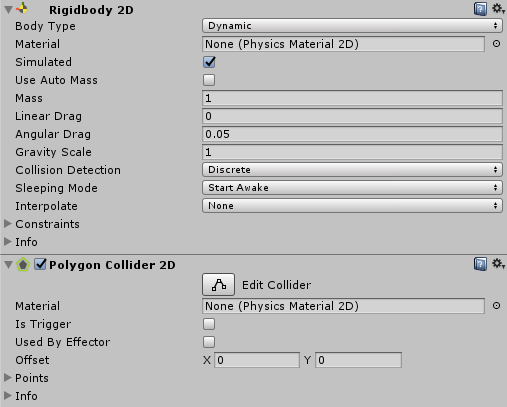 Select the Lander GameObject in the Hierarchy; you’ll see a Rigidbody 2D and Polygon Collider 2D Component are attached. Adding a Rigidbody 2D component to a sprite puts it under control of Unity’s 2D physics system. By itself, a Rigidbody 2D component means gravity will affect a sprite and that you can control the image from script using forces. 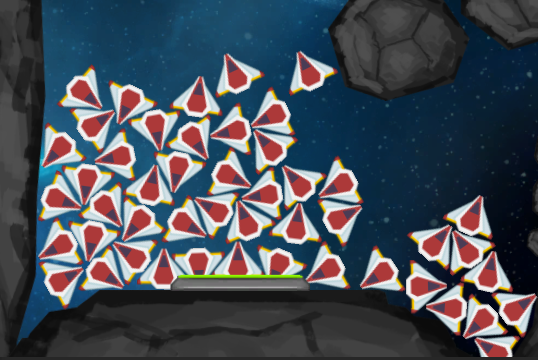 But if you want your sprite to interact and collide with other objects, you’ll also need a Collider 2D component. Adding an appropriate collider component makes a sprite respond to collisions with other sprites. Polygon 2D Colliders are more performance-heavy than other simple colliders such as the Box or Circle Collider 2D components, but they make more precise physical interaction between objects possible. Always use the simplest collider shape you can get away with in your game to ensure you achieve the best possible performance. Leave the shape of the Lander collider as-is for now. Note: The code in the Lander.cs script attached to the Lander GameObject uses OnCollisionEnter2D to handle collisions with other objects in the game scene. If the magnitude of the collision force is above a certain threshold, the lander will be destroyed. Your landing pad also needs a collider; otherwise your spaceship would fall straight through when you tried to land! Unity adds a Box Collider 2D component to the LanderObjective GameObject and automatically sizes the collider to match the sprite size. Cool! Change Rigidbodies to use the Kinematic body type when you want to move your physics bodies via a transform component instead of letting gravity affect them alone. To leave them under control of Unity’s gravity, use Dynamic. If they won’t be moving at all, set them to Static. You can also modify mass, linear drag, angular drag and other physics properties on your Rigidbody components. Colliders can be used in Trigger mode; they won’t physically collide with other physics objects, but instead they let your code react to an event using the OnTriggerEnter2D() available on all MonoBehaviour scripts. To handle collision events in your script code, use OnCollisionEnter2D() which is available on all MonoBehaviour scripts. You can assign optional Physics2D materials to your Colliders to control properties such as Bounciness or Friction. Note: You may not notice it when there’s only a few objects in a game, but when you have hundreds of objects onscreen, all involved in physics interactions, using simpler collider shapes will greatly improve the performance of your game. 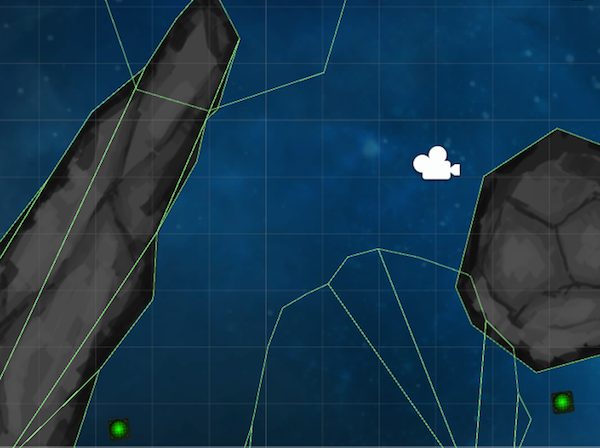 You may want to re-think your strategy of using Polygon Collider 2D components if you have lots of objects colliding! Your lander would not be complete without visible thrusters boosting out to counter gravity. 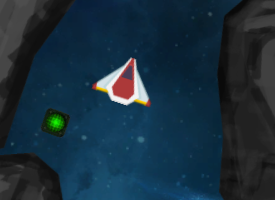 Right now the thrusters work, but there is no visual feedback to tell you they’re firing. To assign animation to GameObjects in your scene, you attach an Animator component to the GameObject(s) you wish to animate. 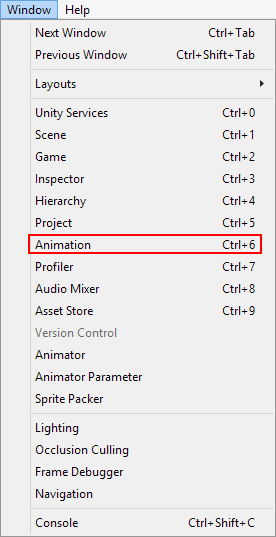 This Component requires a reference to an Animation Controller that defines which animation clips to use and how to control these clips, along with other “fancier” effects such as blending and transitioning of animations. Enter the name ThrusterAnim and place it in the AssetsAnimations folder. You should see an animation timeline in the Animation window at this point; this is where you can place and order the individual thruster sprite frames. 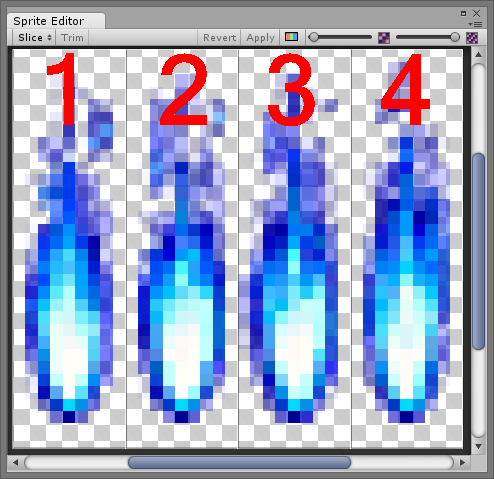 In the Project window, click the Sprites folder and expand the thruster-spritesheet.png sprite. 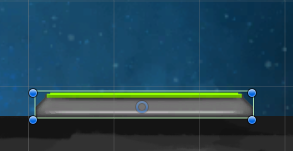 Highlight the four sliced thruster sprites and drag them onto the ThrusterMain : Sprite timeline in the Animation editor. Select the last frame and press Delete to remove it. Time to configure the animation controller. The Lander.cs script currently sets Animation Parameters to true or false, depending on whether or not the player is firing the thrusters. The animation controller will evaluate these parameters and allow certain states to be entered or exited. 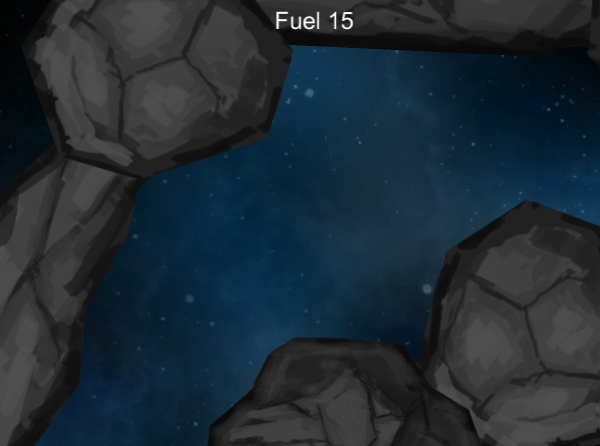 Right now, the thruster animation is running continuously. Logically, the thruster animation should only run if the player is currently firing the thruster. From Entry, the animator should flow directly to NoThrust and stay there until a boolean parameter becomes true. For animation state changes to occur, you’ll need to add connections using transitions. The orange color indicates that the state will be the first state that will be run. 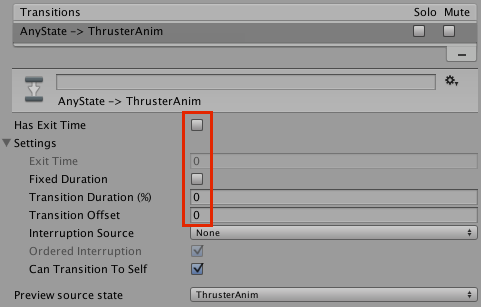 Click the NoThrust to ThrusterAnim transition line, then click + in the Inspector to add a Condition. This selects the only condition available – ApplyingThrust. Ensure true is selected in the drop down. This indicates ApplyingThrust must be true for the animation to move to the ThrusterAnim state. No 2D engine would be complete without sprite-sorting abilities. 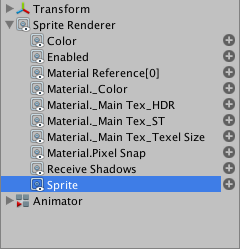 Unity lets you sort and order sprites using a system of Layers and Order in layers. This happens because the rendering engine can’t decide the layering order of the sprites. All sprites, except for the ship, are currently set to use the Default sorting layer with a rendering order of 0. To fix this, you can use a system of Layers and Order in layers to separate sprites. Unity will render sprites on these layers in the defined order of the layers. For each individual layer, Unity will use the Sprite’s Order in Layer numbering on each sprite to determine in which order it should render each sprite. Click the Edit menu, then click Project Settings and choose Tags & Layers. Expand the Sorting Layers section. Since the rocks in your scene tend to overlap each other, they’re a good object to demonstrate how the Order in Layer property works for sprites on a specific Layer. If you didn’t give each rock in the Rocks layer separate ordering values, you would notice rocks randomly ‘popping’ over others during gameplay. This is because Unity won’t consistently render the rocks in the same order, since they all have an order in layer value of 0. Change the Sprite Renderer Sorting Layer properties for the Lander and its child GameObjects, and all Fuel GameObjects under Pickups to Player. This will ensure they are rendered in front of everything. There is one problem however. What about the sprites for the thruster animations (and the lander’s feet that normally hide behind the lander)? If we don’t set a specific Order in Layer number for these and for the Lander itself, we will see some odd rendering problems! Change the Order in Layer property for the Lander itself to be 2. 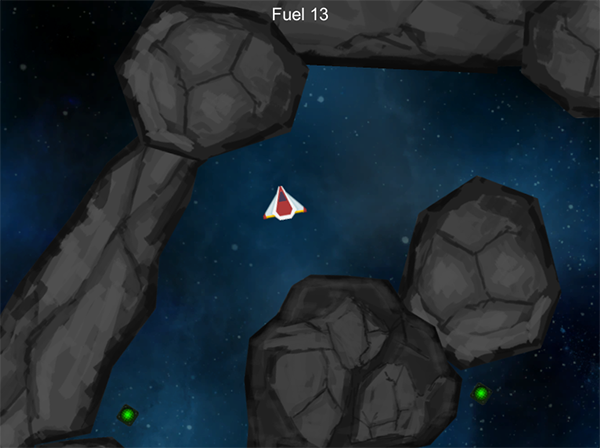 Select each Thruster child GameObject, as well as the LanderFeet GameObject, and set their Order in Layer values to 1. When the lander touches down on the landing pad, the pad sinks down a little to show that you’ve landed. The landing pad and rock sprites overlap each other, so for the effect to look right, you’ll have to order the landing pad behind the rock. Change the LanderObjective sprite to use the Rocks layer, and assign it an Order in Layer value of 0. You’ve covered most of the important 2D design features of Unity, and you have a fun little gravity lander game to show for it! If you’d like to dive deeper into Unity’s 2D tools and features, you should definitely start by reading through the official Unity 2D game creation page.